Manufacturing, exporting and supplying the highly durable, efficient Curing Oven; we are listed among the most reliable companies in the industry. With our rich industry experience, we are capable of bringing forth the quality assured Curing Oven at the most affordable prices. 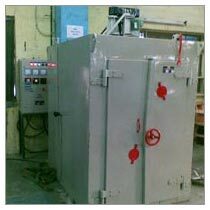 We are globally recognized for the Curing Ovens that are used in several industries for various applications as in thermo set plastics, adhesives, coating, rubber and composites. We have gained expertise in this domain and we design the ovens for consistent airflow that allows proper curing across the entire load and to ensure precise control for repeatable results; we ensure tight temperature tolerance.